Recently I embarked on a research trip to the regions of Phnom Penh, Kompong Speu, Siem Reap and Battambang in Cambodia. 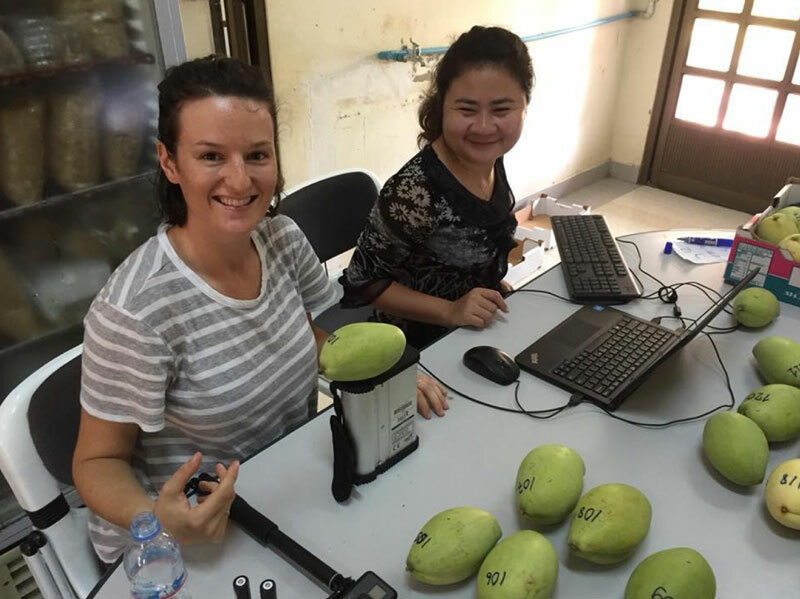 My Crawfund Fund supported trip was connected to the ACIAR project (HORT/2012/003) which is researching how to build a resilient mango industry in Cambodia and Australia. Using Near Infrared Spectrometer in Cambodia at CARDI for the first time. Teaching CARDI staff in the use of new technology. The project and my trip to Cambodia involved developing production, harvest and post-harvest handling practices that improve fruit quality to meet consumer expectations and allow for Keo Romeat mangoes to be stored, transported and potentially exported internationally. The changes to handling practices aim to drastically improve the market opportunity of Cambodian mango farmers. Mangoes are currently a low-income product, often sold for prices well below those of the neighbouring countries. Similarly, the quality and ability to store Cambodian mangoes is too low to for export. The results from the post-harvest handling trial will contribute to the development of Good Agricultural Practices (GAP) for the production of mangoes for export in Cambodia and become a guide for producers. Through farm visits and collaboration with relevant agencies in Cambodia, I have begun to identify a range of drivers that influence grower decision making. These drivers are highly unique regionally and also vary significantly between producers, therefore I found that there is little to no uniformity in management and marketing practices. These drivers range from land ownership, environmental degradation, fast financial returns to foreign investment, access to agricultural resources such as water, fertilisers and chemicals, as well as access to information regarding production methods and use of resources. By using local farms as a source of trial fruit, working closely with local researchers and encouraging the involvement of private enterprise in the trials we have allowed for ongoing development of our understanding of these drivers and simultaneously developed passages for ongoing dialogue between various stakeholders. A comprehensive experimental design developed collaboratively by the Cambodian Agricultural Research and Development Institute (CARDI), Royal University of Agriculture (RUA), NSW Department of Primary Industries (NSW DPI) and NT Department of Primary Industries and Resource (NT DPIR) trialled the use of fungicide at various concentrations and treatment times, procedures for stem removal, packaging types and cold storage times, while assessing the impact of water quality and fruit maturity on various quality parameters. Group work, harvesting fruit using new practices on private commercial farms. The implementation of improved harvesting practices to reduce fruit blemishes, infection and insect damage, and the establishment of parameters for cold storage of Keo Romeat mangoes have improved fruit quality. Additionally, the research conducted in these trials identified optimal flower induction and crop nutrition practices that will enable farmers to produce higher quality fruit, resulting in improved opportunities for international export and increased economic well-being of farmers in the study area. During this trip I developed relationships with Cambodian researchers from the General Directorate of Agriculture (GDA), CARDI and RUA. These relationships exposed me to a variety of research projects and questions relevant to Cambodian agriculture today, while also gaining insight into the operational parameters in which research is conducted in Cambodia. Similarly, I met and worked with several private enterprises, farmers and locally based non-governmental staff. These were the parties that enabled our team from NSW DPI and NT DPIR to conduct phase one of a trial, to identify post-harvest handling practices that improve the quality and storage life of the local Cambodian Keo Romeat mango. 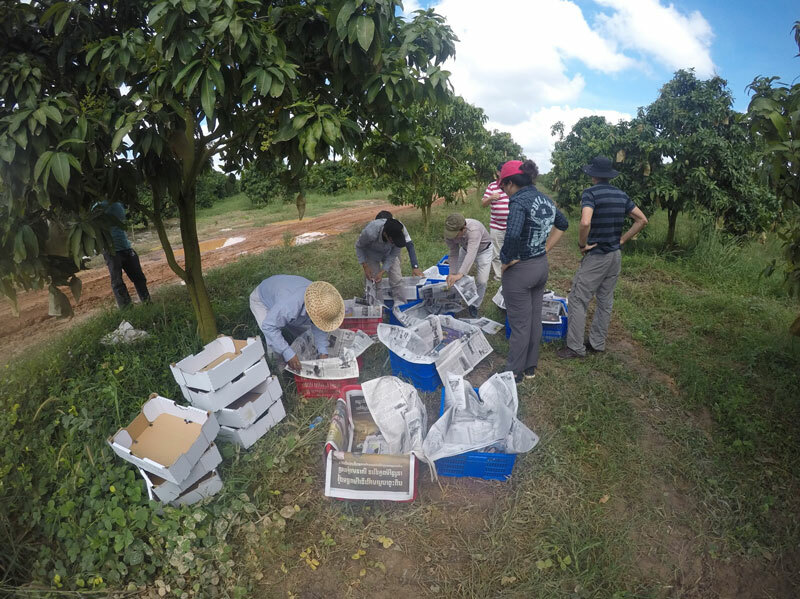 Furthermore, the trip has built the capacity for Cambodian organisations, researchers and students to conduct scientific research which continues to develop mango production in Cambodia. It has also enabled me to build my own capacity to conduct agricultural research overseas and apply knowledge and skills gained in research conducted in Australia, as well as enabled me to maintain and facilitate beneficial relationships with all stakeholders to ensure ongoing collaboration. I would like to extend a very big thank you to the panel members who chose to award me this scholarship, Tania Paul for her guidance and the Crawford Fund as a whole for providing me with this opportunity. Not only have I been able to utilise this opportunity to positively impact agricultural research in Cambodia and Australia, but the impact on my personal, professional and career growth has been immeasurable and will continue to impact my life as I go on to find more opportunities to work within agricultural research fields. I am immensely grateful and hope to continue to remain associated with the Crawford Fund in the future. Maddison’s trip to Cambodia is part of our efforts to support and encourage young Australians in study, careers and volunteering in international agricultural research, our International Agricultural Student Awards from Crawford Fund State Committees will be supporting 14 Australian tertiary students to gain international agricultural research experience and expertise.